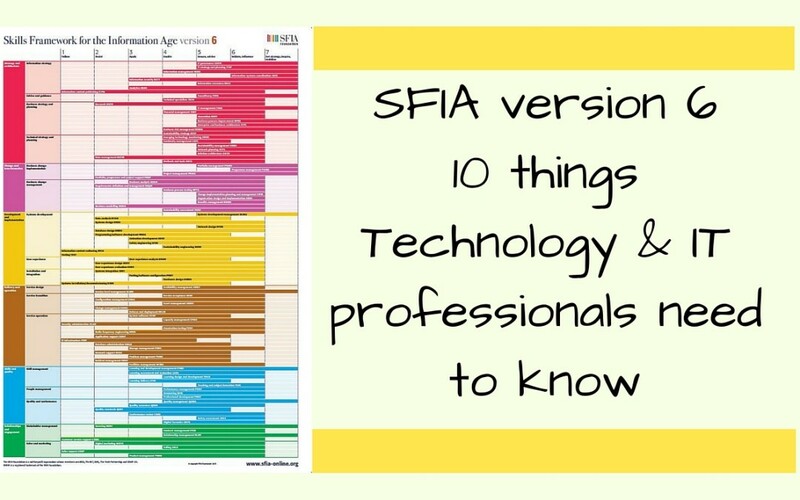 This article complements the summary information provided in 10 things you should know about SFIA. It describes SFIA from an individual’s point of view. What can you use it for, what if you are asked to use it and how can it help you and your career. For individuals; SFIA is completely free to use. It can be browsed or downloaded from the SFIA website. Its available in English, English, German, Spanish, Arabic, Chinese, and Japanese. The only restriction is that you may need to register. The SFIA Foundation is a not for profit body. The only thing you are asked for in return is to register with basic contact information. Note – if you are working for an organisation who has already registered and licensed their use of SFIA then you do not need to register. Unless you wish to use the online browser or download your own copies of the reference material. 2. It’s written in a language and style you will understand. SFIA describes the skills you need in a language which you will understand. The language has been kept simple and jargon free. It does not come from HR or academia. It is written and maintained by practitioners in the Technology / IT industry. The guiding principle is that the framework should be easily understood by IT practitioners. It aims to be both simple enough to use, but with enough detail to be useful. 3. Helps you create a CV or LinkedIn resume. If you struggle to find the right words to capture your experience and your achievements. SFIA can help you craft the right words. You can it as a dictionary / thesaurus to help you describe your skills in a understandable way. Look up your skills and skills levels in SFIA. Use this to help create a high impact CV. Many Technology / IT jobs and vacancies are advertised using SFIA skills and levels. And even for jobs not advertised using SFIA – understanding the structure of SFIA skills and the skill levels will help you get a clear view of your own strengths. SFIA can help you identify relevant job opportunities. It will also put you in the driving seat when you come to apply for positions. Some tools providers are using SFIA to provide the engine for a new form of competency based recruitment. 5. Helps technology / IT career paths – upwards, horizontal or climbing frame. The levels and the range of skills make it easy to clarify your interests and strengths. It then highlights the relevant experiences you might need to move upwards, sideways or downwards. An analogy I use with SFIA is the front wheel and rear wheel of a bicycle. The rear wheel is attached to the pedals and gives you power. In SFIA the levels 1-7 are the engine of your career they give you the power to get where you want to go. The front wheel of the bicycle is for steering and pointing you in the direction in which you want to go. Think of the 97 skills (e.g. Business analysis, Testing, Project management) as the front wheel of your career – like a bicycle you can choose which of these skills you wish to develop and point your career path towards those. A common frustration for technical people is the obstacle to their career of needing to become a manager of people. SFIA describes senior level skills and responsibilities without ever assuming that you need to have a team, or to be a line manager. Ambitious IT professionals can use this to lead discussions with their managers and employers. Many organisations recognise the need to engage and retain deep technical specialists and experts. These organisations are keen to create technical (non-management) career paths. However, they often lack the ability to describe what is expected at senior levels for technical specialists. This is where SFIA comes into its own in describing the skills and typical responsibilities in a clear way. Some Technology skills frameworks describes skills but not necessarily the levels you need. SFIA provides descriptions of skill levels. This enables you to understand where you are and where you would like to be. It helps with indicators of what you need to be doing to increase your skill level. It is written in a style which identifies the activities / tasks / responsibilities you need to reach your target skill level. This is a very important distinction. One of the reasons that SFIA was developed was to help individuals and organisation cut through the jargon of job titles. The industry is full of weird and wonderful job titles. Its also quite common that 2 people with the same job title will be doing very different things. Now add to this mix the proliferation of prefixes – senior, junior, associate, lead, principal, head of, director of, VP etc. etc. It’s a confusing picture and not at all helpful for individuals or employers. SFIA cuts through the complexity by going beyond a job title to identify the skills and responsibilities required and the level at which they are required. This helps you in 2 ways – assessing your own skills and understanding what skills are needed for a particular job – this could be your current job, a future career step, or a vacancy. It could also be a professional qualification / accreditation. 9. Helps you find relevant training and qualifications and helps you distinguish what qualifications provide and what they assess. There are a wide range of Technology / IT related training, certifications and qualifications. Some are more valuable than others. You can use the SFIA structure, levels and capability model to choose which is best for you. SFIA will also help you understand whether the training is based on the acquisition of knowledge (learning stuff) or the application of knowledge (doing stuff). Demonstrating the application of knowledge is most valuable in improving your performance and developing your career. 10. It does not describe everything about your skills and knowledge. SFIA provides description for professional Technology / IT skills. These are the skills which define your professional capability. They are the ones which will have longevity. Your knowledge – these may cover knowledge of specific technologies, applications, business areas, applications etc. Your experience and your qualifications. You can browse online at the the SFIA website. You must register first. Then when you are logged in, then you can see the complete framework. This covers all 97 professional skills. Each with an overall skill definition, and with up to 7 skill level definitions. You can also view the 4 generic responsibilities (Autonomy, Influence, Complexity, Business skills) at 7 levels – a total of 28 definitions. The browser version is available in English, German, Spanish, Arabic, Chinese, and Japanese. Theses are available in English, German, Spanish, Arabic, Chinese, and Japanese.